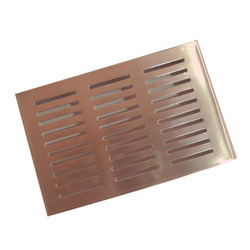 To meet the variegated specifications of our renowned clients, we are engaged in manufacturing, exporting and supplying a wide range of Ventilation Grill. - Used for ventilation purposes. 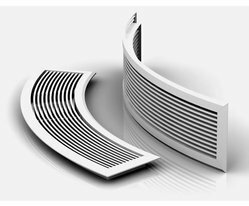 Aerofoil louvers with 0, 150, 300, and 450 defelections.suitable for side wall, floors sill and ceiling mountings. Curved Wall require Curved Grilles to fit the contour of the wall or ceiling. It can be used for both supply and return air. Buy high performance, excellently finished and optimally functioning Ventilation Grills at market leading prices from us. Our company is ranked among well reckoned Ventilation Grills’ Manufacturers, Exporters and Suppliers. We offer them in varied specifications and provide customized solutions. Interested buyers can purchase Ventilation Grills from us as per requirement. Linear Fixed Bar Grilles, Horizontal Fixed Bars, Slimline Blade (3 mm nominal thickness)Grille height 16 mm. Linear Fixed Bar Grilles, Horizontal Fixed Bars, Normal Blade (5 mm nominal thickness)Grille height 16 mm. - Single of double deflection grill used for supply and return air with 25 mm border type frame. - Available as standard with horizontal front row blades. - Manufactured from aluminium extrusion, powder painted white. - Standard fixing system by screws or concealed fixing on demand. Acoustic Air Transfer Grilles model DSRX constructed from high quality extruded aluminium construction accoustic transfer grilles with internal accoustic damping media. Matching frames are to be used for door and partition arrangements. Our organization has successfully expanded its business in market owing to the offered elevated quality range of Air Transfer Door Grill.